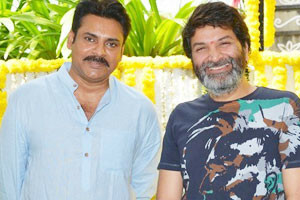 After delivering two super hits with Jalsa and Atharintiki Dharedi, maverick actor-director duo Pawan Kalyan and Trivikram have joined forces once again for a movie to be produced by S Radhakrishna. According to the latest update, this as-yet-untitled film will be having its regular shooting from March 14th. This means that Pawan will be taking a very brief break after wrapping up his ongoing action entertainer, Katamarayudu. This movie will have young beauties Keerthy Suresh and Anu Emmanuel romancing Pawan Kalyan. Hotshot Tamil music composer Anirudh Ravichander will be scoring the film’s soundtrack.